We got used to think that technologies of the future are all coming from Silicon Valley. Once you exceed the bounds of it, something even more amazing and fairy reveals itself. For instance, paper, which produces electricity. Such unexpected things are the results of work at Disney Research, a research department of the world`s entertainment giant. Aerial Burton Japanese Company introduced a Fairy Lights stereo display, which allows touching an image “in the air” safely. Volumetric pixels called voxels are formed in space by means of very short pulses from infrared laser. The air ionizes from these pulses in the kept position and creates a micro-droplet of plasma, which shines with light of blue and white. Systems alike existed before but it was impossible to touch the images within those systems. It caused burns as a result. Now, Aerial Burton began using so short light pulses that they would need more time to injure the skin of a human being. When to touching the plasma, it becomes brighter and generated shock waves cause tactic sensations. Thus, plasma gives visual and haptic feedback at the same time and small three-dimensional images may serve as indicators or spatial keys or buttons of sorts. Potentially, it might make it to where 3D touch screens will appear in the near future. 3-dimensional computer screens is something the scientists from university in Lancaster works on. They draw out its project and presented at the conference in South Korea recently. One more achievement in the area of 3D technology and virtual reality is Airstrike devised by Japan and French engineers. 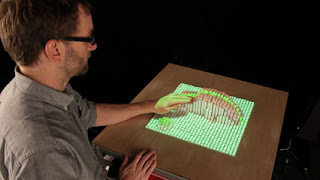 Innovative system allows navigating the designed 3-dimensional image with hands without touching the screen. One may touch the image with his/her finger putting on it a special ribbon beforehand. Scientists from Bristol University developed a system, which allows feeling the shape of virtual object by means of ultrasound. This technology will find its application not only in the sphere of entertainment but also in medicine. For example, the system can be used in the process of rehabilitation of the patients and for the future surgeons training. In order for feeling the shape of the object, one should keep one`s hands above the device. To imagine what shapes the system is capable of realizing, the specialists directed the waves into the thin layer of oil pouring the light from the lamp across the created niches. According to what the creators say, one may use the system together with the systems of 3D images setting-up. Thus, holograms and objects, which were designed with the help of augmented reality technology, will be available not for viewing only but also for touching. Enjoy online traveling with Melisa!